No invention in modern times has had as much of an impact on human life as the invention of the automobile. It has become an important influence on the history, economy, and social life of much of the world. In fact, the rapid growth of the United States in the twentieth century can be directly related to the automobile. Automobiles reach into every aspect of society, from the design of our cities to such personal uses as vacation travel, dining, and shopping. 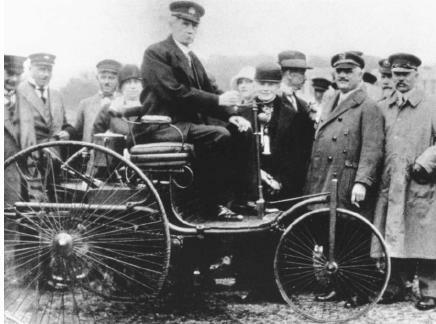 Mass-production techniques, first developed for the automobile, have been adapted for use in nearly every industry. Meanwhile, dozens of industries depend, directly or indirectly, on the automobile. These industries include producers of steel and other metals, plastics, rubber, glass, fabrics, petroleum products, and electronic components. Hundreds of individual parts make up the essential components of the modern automobile. Much like the human body, these parts are arranged into several systems, each with a different function. Each system is necessary for making the automobile run, keeping it safe, and reducing noise and pollution. The major systems of an automobile are the engine, fuel system, exhaust system, cooling system, lubrication system, electrical system, transmission, and the chassis. The chassis includes the wheels and tires, the brakes, the suspension system, and the body. These systems will be found in every form of motor vehicle and are designed to interact with and support each other. of the engine. This burning occurs inside cylinders, which contain pistons. The pistons are attached, via a connecting rod, to a crankshaft. Gasoline, the most common automobile fuel, is pulled into the cylinder by the vacuum created as the piston moves down through the cylinder. The gasoline is then compressed up into the cylinder by the upward movement of the piston. A spark is introduced through a spark plug placed at the end of the cylinder. The spark causes the gasoline to explode, and the explosion drives the piston down again into the cylinder. This movement, called the power stroke, turns the crankshaft. A final movement of the piston upward again forces the exhaust gases, the byproducts of the fuel's combustion, from the cylinder. These four movements—intake, compression, power, exhaust—are called strokes. The four-stroke engine is the most common type of automobile engine. Fuel system. Gasoline must be properly mixed with air before it can be introduced into the cylinder. The combination of gasoline and air creates a greater explosion. The fuel pump draws the gasoline from the gas tank mounted at the rear of the car. The gasoline is drawn into a carburetor on some cars, while it is fuel-injected on others. Both devices mix the gasoline with air (approximately 14 parts of air to 1 part of gasoline) and spray this mixture as a fine mist into the cylinders. Other parts of the fuel system include the air cleaner (a filter to ensure that the air mixed into the fuel is free of impurities) and the intake manifold (distributes the fuel mixture to the cylinders). Exhaust system. After the fuel is burned in the pistons, the gases and heat created must be released from the cylinder to make room for the next intake of fuel. The exhaust system is also responsible for reducing the noise caused by the explosion of the fuel. Exhaust gases are released from the cylinder through an exhaust valve. The gases gather in an exhaust manifold before eventually being channeled through the exhaust pipe and muffler and finally out the tailpipe and away from the car. The muffler is constructed with a maze of baffles, specially developed walls that absorb energy (in the form of heat, force, and sound) as the exhaust passes through the muffler. The burning of fuel creates hazardous gases (hydrocarbons, carbon monoxide, and nitrogen oxide) that are extremely harmful to the engine's components and the environment. The emission control system of a car, linked to the exhaust system, functions in two primary ways. First, it reduces the levels of unburned fuel by burning as much of the exhaust as possible. It does this by returning the exhaust to the fuel-air mixture injected into the cylinders. Second, it uses a catalytic converter (fitted before the muffler) to increase the conversion of the harmful gases to less harmful forms. Cooling system. The cooling system also maintains the engine at a temperature that will allow it to run most efficiently. A liquid-cooled system is most commonly used. The explosion of fuel in the cylinders can produce temperatures as high as 4000°F (2204°C). Liquid-cooling systems use water (mixed with an antifreeze that lowers the freezing point and raises the boiling point of water) guided through a series of jackets attached around the engine. As the water solution circulates through the jackets, it absorbs the heat from the engine. It is then pumped to the radiator at the front of the car, which is constructed of many small pipes and thin metal fins. This design creates a large surface area that draws the heat from the water solution. A fan attached to the radiator uses the wind created by the movement of the car to cool the water solution further. Temperature sensors in the engine control the operation of the cooling system so that the engine remains in its optimal temperature range. Lubrication. Without the proper lubrication, the heat and friction created by the rapid movements of the engine's parts would quickly cause it to fail. At the bottom of the engine is the crankcase, which holds a supply of oil. A pump, powered by the engine, carries oil from the crankcase and through a series of passages and holes to all the various parts of the engine. As the oil flows through the engine, it forms a thin layer between the moving parts so they do not actually touch. The heated oil drains back into the crankcase, where it cools. The fumes given off by the crankcase are circulated by the PCV (positive crankcase ventilation) valve back to the cylinders, where they are burned off, further reducing the level of pollution given off by the automobile. Electrical system. Electricity is used for many parts of the car, from the headlights to the radio, but its chief function is to provide the electrical spark needed to ignite the fuel in the cylinders. The electrical system is comprised of a battery, starter motor, alternator, distributor, ignition coil, and ignition switch. The starter motor is necessary for generating the power to carry the engine through its initial movements. Initial voltage is supplied by the battery, which is kept charged by the alternator. The alternator creates electrical current from the movement of the engine, much as windmills and watermills generate current from the movement of air or water. Turning the key in the ignition switch draws electrical current from the battery. This current, however, is not strong enough to provide spark to the spark plugs. The current is therefore drawn through the ignition coil, which is comprised of the tight primary winding and the looser secondary winding. The introduction of current between these windings creates a powerful magnetic field. Interrupting the current flow, which happens many times a second, causes the magnetic field to collapse. The collapsing of the magnetic field produces a powerful electrical surge. In this way, the 12-volt current from the battery is converted to the 20,000 volts needed to ignite the gasoline. Because there are two or more cylinders, and therefore as many spark plugs, this powerful current must be distributed—by the distributor—to each spark plug in a carefully controlled sequence. This sequence must be carefully timed so that the cylinders, and the pistons powering the crankshaft, work smoothly together. For this reason, most present-day automobiles utilize an electronic ignition, in which a computer precisely controls the timing and distribution of current to the spark plugs. Transmission. Once the pistons are firing and the crankshaft is spinning, this energy must be converted, or transmitted, to drive the wheels. The crankshaft spins only within a limited range, usually between 1,000 to 6,000 revolutions per minute (rpm). Although the wheels spin at far lower rpms, the range at which they spin is wider (to accommodate the wide range of driving speeds of an automobile). The gears of the transmission accomplish the task of bringing down the fast-spinning input from the crankshaft to the smaller number of rpms needed by the wheels. There are two types of transmission: manual and automatic. Automobiles generally have at least three gears, plus a reverse gear (many manual transmissions have four or even five gears). With manual transmission, the driver controls the shifting of the gears. In an automatic transmission, gears are engaged automatically. Both types of transmission make use of a clutch, which allows the gears to be engaged and disengaged. Chassis. The chassis is the framework to which the various parts of the automobile are mounted. The chassis must be strong enough to bear the weight of the car, yet somewhat flexible in order to sustain the shocks and tension caused by turning and road conditions. Attached to the chassis are the wheels and steering assembly, the brakes, the suspension, and the body. The steering system allows the front wheels to guide the automobile. The steering wheel is attached to the steering column, which in turn is fitted to a gear assembly that allows the circular movement of the steering wheel to be converted to the straight movement of the front wheels. The gear assembly is attached to the front axle by tie rods. The axle is connected to the hubs of the wheels. Wheels and the tires around them form the automobile's only contact with the road. Tires are generally made of layers of rubber or synthetic rubber around steel fibers that greatly increase the rubber's strength and ability to resist puncture. Proper inflation of the tires improves fuel efficiency and decreases wear on the tires. When applied to the wheels, brakes provide friction that causes the wheels to stop turning. The suspension system enables the automobile to absorb the bumps and variations in the road surface, keeping the automobile stable. Most cars feature independent front suspension (the two wheels in front are supported separately). In this way, if one wheel hits a bump while the other wheel is in a dip, both wheels will maintain contact with the road. This is especially important because steering the automobile is performed with the front wheels. More and more cars also feature independent rear suspension, improving handling and the smoothness of the ride. The main components of the suspension system are the springs and the shock absorbers. The springs suspend the automobile above the wheel, absorbing the bumps in the road surface. As the chassis bounces on the springs, the shock absorbers act to dampen, or quiet, the movement of the springs. The body of a car is usually composed of steel or aluminum, although fiberglass and plastic are also used. While the body forms the passenger compartment, offers storage space, and houses the automobile's systems, it has other important functions as well. In most instances, its solid structure protects passengers from the force of an accident. Other parts of the car, such as the front and hood, are designed to crumple easily, thereby absorbing much of the impact of a crash. A firewall between the engine and the interior of the car protects passengers in case of a fire. Lastly, the body's design helps to reduce the level of wind resistance as the car moves, allowing the driver better handling ability and improving the efficiency of the engine. Please what are the various types of suspension system we have?and also i am engineering student at the Accra Technical Training Centre(A.T.T.C) and i need a help from you. Very good effort for auto Mobile students i am also a student of b.s.c automobiles engineering i really get very important information from this site . Keep it up. And thanks for helping us.